San Diego, CA, and Melbourne, Australia, January 16, 2008 -- Members of the Australian American Leadership Dialogue (AALD) meeting at Calit2 in San Diego were linked over a super-broadband network to the University of Melbourne's new OptIPortal tiled wall display (based on technology first developed by the Calit2-led OptIPuter project). Australia's Deputy Prime Minister Julia Gillard and Victorian Premier John Brumby today joined politicians, industry, science and media representatives – on both sides of the Pacific – to experience a powerful, next generation ultra-resolution visualization carried over the super-broadband network linking the University of Melbourne and the UCSD division of Calit2. In an Australian first, this next-generation platform – set to revolutionize the way Australia interacts with the rest of the world – allows real-time, interactive collaboration across the globe, combining high-definition video and audio with the sharing of ultra-resolution visualizations from a broad range of disciplines. Today’s demonstration was an initiative of the Australian American Leadership Dialogue (AALD). The organization held its West Coast Leadership Dialogue at UC San Diego's Graduate School for International Relations and Pacific Studies (IR/PS), and the meeting was hosted by IR/PS Dean Peter Cowhey, a long-time academic participant in the UCSD division of Calit2. 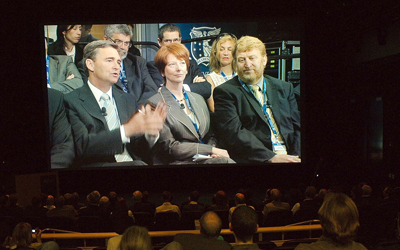 As seen on Calit2's 4K display in San Diego, Australian dignitaries in the OzIPortal lab in Melbourne included Victorian Premier John Brumby (left front) and Australia's Deputy Prime Minister Julia Gillard (middle). In the last two months, the University of Melbourne has constructed a massive 96 million pixel “OptIPortal” visualization wall – known affectionately as the ‘OzIPortal’ – constructed from 24 x 30-inch LCD screens. For comparision, a standard PC can show about 1-2 million pixels. Funding for the OptIPortal has been provided by the Victorian Government ($120,000) and the University of Melbourne ($500,000). 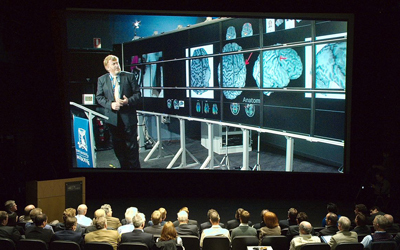 This ultra-resolution OptIPortal visualization wall – the largest in Australia – enabled scientists, industry leaders and politicians in Melbourne to demonstrate cutting-edge medical and environmental research to participants in the AALD’s meeting at UC San Diego using a novel interactive high-definition television stream over a 1000 megabit/sec (“gigabit/s”) super-broadband optical fiber connection. Calit2's Bahadir Gul, Brian Dunne and Qian Liu (left to right) troubleshoot the 1 Gigabit per second streams between San Diego and Melbourne. Bringing the OptIPortal and gigabit/s super-broadband networking together is the cutting-edge expertise of two of the world’s leading telecommunications research units: the University of Melbourne School of Engineering’s Centre for Ultra Broadband Information Networks (CUBIN), and the California Institute for Telecommunications and Information Technology (Calit2), a UCSD/UC Irvine partnership. The link-up was made possible by use of the high-capacity backbone of AARNet, Australia’s academic and research network, with a connection to the U.S. West Coast using SXTransPORT on the Southern Cross Cable Network to the Calit2 network in San Diego via Pacific Wave and CENIC. In Melbourne, Deputy Prime Minister Gillard and Premier Brumby joined Victorian Opposition Leader Ted Baillieu, Federal Minister for Innovation, Industry, Science and Research Senator Kim Carr, Federal Opposition Education spokesman Tony Smith and Qantas Chairman, Leigh Clifford. 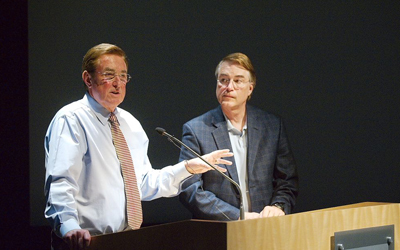 AALD founder Phil Scanlan (left) and Calit2 director Larry Smarr co-hosted the trans-Pacific super-broadband video conference. The cross-Pacific discussion included presentations demonstrating the capacity of the OptIPortal by leading neuroscientist, Professor Graeme Jackson, and water researcher, Professor John Langford, both from the University of Melbourne. 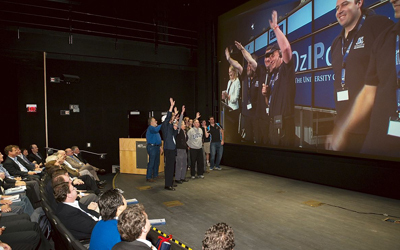 Participants in San Diego including the Director of Calit2, Professor Larry Smarr, and the Vice-Chancellor of the University of Melbourne, Professor Glyn Davis, were able to quiz Professor Langford and Professor Jackson as if they were in the same room. Amanda Johnston, an Executive Director at BigPond, co-moderated the discussion in Melbourne with Phil Scanlan, founder of the Australian American Leadership Dialogue, in San Diego. Unique in Australia, the OptIPortal facility brings together two individual concepts: ultra-resolution visualization walls and high-definition video collaboration technologies, creating a powerful new tool enabling collaborative research across great distances in real time with participants visually exploring massive data sets. University of Melbourne neuroscience professor Graeme Jackson displays his epilepsy research on the new OzIPortal. 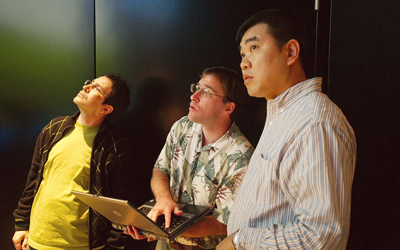 Researchers from the Calit2 Visualization Laboratory, including Kai-Uwe Doerr, So Yamaoka, Jason Kimball and Tom Wypych, developed CGLX, the visualization framework that is giving the OzIPortal (above, with University of Melbourne Dean of Engineering Ivan Mareels and molecular visualization) its wings. CGLX, an R&D development framework for tiled display systems, provides users with a distributed and synchronized OpenGL context, and enables the transformation of OpenGL-based applications into cluster-aware visualization applications that can scale from individual laptops to networked, massively tiled display environments operating at hundreds of millions of pixels resolution (or in the OzIPortal's case, 100 million pixels). With CGLX, for many applications, cluster awareness can be achieved after adding as few as three lines of code. The group of Professor Falko Kuester also developed the CGLX-based applications that were demonstrated on the Australian OzIPortal today, providing access to tiled image viewing capabilities that make it possible to freely migrate static images between display tiles, play back or stream HD-quality video or render full-resolution 3D computer models, concurrently. 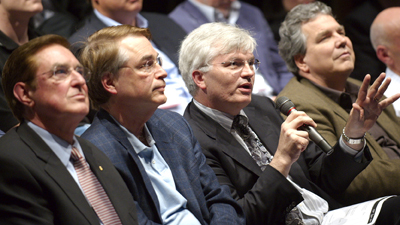 (l-r) AALD Founder Phil Scanlan, Calit2 Director Larry Smarr, University of Melbourne Vice Chancellor Glyn Davis, and IR/PS Dean Peter Cowhey in the San Diego audience. Leadership Dialogue founder Phil Scanlan says the key to Australia’s ability to sustain high community performance is its capacity and commitment to invest in education, science, technology, human capital and related areas of human endeavor that deliver gold medal outcomes. The University of Melbourne demonstration marks a major milestone in Australia’s triumph over the ‘tyranny of distance’ – from its first overseas telecommunications link in 1872, first overseas airmail in 1935 and passenger flight, 1935, to its first overseas Internet connection at the University of Melbourne in 1989. With nearly 100 million pixels in view, compared to one or two million pixels for a typical PC screen, the Melbourne OzIPortal’s HIPerSpace tiled display provides amazing ultra-resolution visualisation. 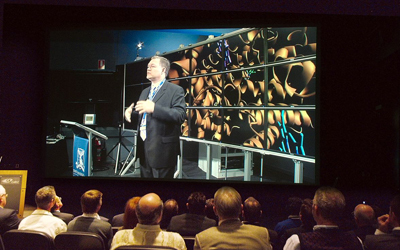 It was built in collaboration with the OptIPortal team, including experts at the UCSD and UCI campuses of Calit2, at the San Diego Supercomputer Center, and at the Electronic Visualisation Laboratory at the University of Illinois at Chicago. This technology opens exciting news ways of performing research. Researchers across the globe will be able to share unique instruments – MRIs, synchrotrons, supercomputers, square km radio telescope arrays – and collaborate to interpret, on the spot, complex data which could range in origin from the artistic world, gaming and cinematography to leading-edge advances in the characterization of brain function and the human genome. The current facility will be expanded in a straightforward and modular way to include other collaborators at different sites in Victoria and in other parts of Australia. With the OptIPortal, scholars in different locations can appreciate the fine details of a work of art, medical scientists can explore a range of images of the brain from different scanning sources all at one time, researchers can explore new materials constructed by computer. In a city such as Melbourne, planners can explore, all at once, population density, ethnicity, crime patterns, water consumption, socio-economic factors, and so on. Students in schools and universities can ‘go on exchange’ with overseas institutions without leaving their classroom. In medicine, it holds the promise of providing access to high-quality, specialized expertise for health professionals in regional Australia or even Antarctica. The OptIPortal is connected over AARNet’s trans-Pacific fiber optic network and uses high-definition video. AARNet has pioneered the global use of high-definition television streams since 2004 and now adds in the capability of ultra-resolution visualization. The resulting OptIPlanet Collaboratory means we can interact with a remote location just as if it was ‘right here’. The OptIPortal is nearly 50 times higher resolution than the highest-resolution HD TV commercially available. The software that powers the OptIPortal is capable of magnifying images to a large size and still keep full clarity, for instance, a scan of the brain can be shown at to the cellular level and maintain full clarity. The 'secret sauce' that allows Melbourne's OziPortal to be able to show the stunning images shown today is the Cluster-GL for Heterogeneous Systems (CGLX) framework for freely scalable multi-tile visualisation and synchronization. The University of Melbourne is Australia’s leading research university, based on a number of indicators. The Times Higher Education Supplement recognized Melbourne as Australia’s leading university in technology teaching and research. The University - the gateway for Australia’s first overseas internet connection in 1989 – is at the forefront of ICT research in Australia through key research centres, CUBIN (Centre for Ultra Broadband Information Networks) and NICTA (National ICT Australia). AARNet Pty Ltd (APL) is the company that operates Australia's Academic and Research Network (AARNet). It is a not-for-profit company limited by shares. The shareholders are 38 Australian universities and the CSIRO. AARNet provides high-capacity leading edge Internet services for the tertiary education and research sector communities and their research partners. AARNet serves more than one million end users who access the network through local area networks at member institutions. For further information, please visit: www.aarnet.edu.au. Founded in 1992, the annual bipartisan Australian American Leadership Dialogue alternates between Washington DC and a major Australian capital city. In recent years, the Leadership Dialogue has also accessed the best institutional infrastructure on the west coast of the USA, in order to engage some of their best and brightest about the next phase of nation building in both countries. Based on the “OptIPuter” research project (www.optiputer.net) funded by the U.S. National Science Foundation for six years, 2008 will see the establishment of a persistent global collaboration laboratory combining high definition and digital cinema video streams with ultra-resolution visualisation facilities, termed the OptIPlanet Collaboratory, connecting many centres for innovation around the world.